As I mentioned a few days ago, in my “9 Lessons Learned in Savannah” post, I spent some time earlier this month exploring the barrier islands off the coast of Georgia… chasing dolphins, swatting mosquitos, and soaking up gin and history. 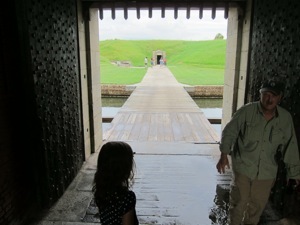 In that post, as I recall, I noted that I visited Fort Pulaski – the historic setting of the celebrated 2012 documentary Abe Lincoln vs. Zombies. Well, for some reason that I can’t quite explain, I feel compelled today to go into greater depth on the actual, real history of the Fort, knowing full well that none of you will likely give a damn. 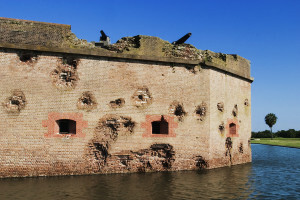 Built on Georgia’s Cockspur Island with approximately 25 million bricks, the Fort, with its 11-foot thick walls, was an incredible accomplishment of modern engineering. It was thought to be invincible. 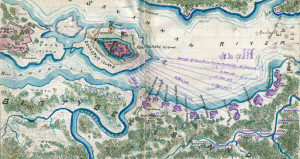 The U.S. Chief of Engineers, General Joseph Gilbert Totten, is quoted as saying of the Fort, “You might as well bombard the Rocky Mountains.” Alligator-infested waters surrounded the Fort, no ship could safely approach it, and Tybee Island, the closest land on which one could mount a cannon, was well over a mile away. General Robert E. Lee famously said of the Fort, upon its completion, “They will make it pretty warm for you here with shells, but they cannot breach your walls at that distance.” Short of cutting the Fort’s supply lines, and starving the garrison into submission, it would seem that the Fort could withstand anything. As luck would have it, the shells from British warships never came, and the Fort sat for the next 15 years, untested in battle. Perhaps because of our significant investment in building these coastal forts, no one had tried to assault us from the Atlantic. And, by the time we began fighting the Mexican-American War in 1846, our attention had drifted almost completely away from the Savannah Fort named after Polish nobleman Kazimierz Pulaski. (Pulaski died in 1779 from wounds sustained in an attempt to retake Savannah from the British during the Revolutionary War.) 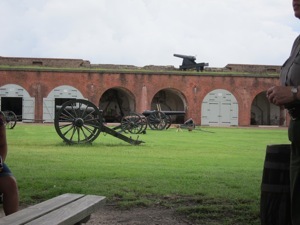 By the time that South Carolina seceded from the union, in 1861, there were only two people manning the fort… one to maintain the artillery, and a custodian charged with keeping up the structure. The unconquerable Fort was essentially in mothballs. But things took yet another turn as Georgia prepared to follow the lead South Carolina and secede. The Governor of Georgia, Joseph E. Brown, having witnessed the Union blockade of South Carolina’s ports, decided that, prior to seceding, he needed to secure Fort Pulaski, and control access to the port of Savannah, which, if memory serves, is about 16 miles upriver. So, the Georgia militia was given the word to take the Fort, which they did. After a rousing rally in downtown Savannah, 150 men made their way to the Fort, and took possession. The next several weeks were spent readying the Fort for the battle which they knew lay ahead, practicing with the cannons, and digging a web of deep trenches through the parade grounds sitting at the center of the Fort, in hopes that they might catch and contain the cannon balls which, they knew, would soon be raining down from Union ships. (As I understand it, the primary damage caused by cannon balls happens after they hit the ground, and start rolling and bouncing through both walls and men, ripping off arms, legs and heads.) So, they sat and waited, secure in the knowledge that their fort was impenetrable. Union forces took possession of the Fort, and subsequently stopped all shipping in and out of Savannah, crippling the Confederate war effort. 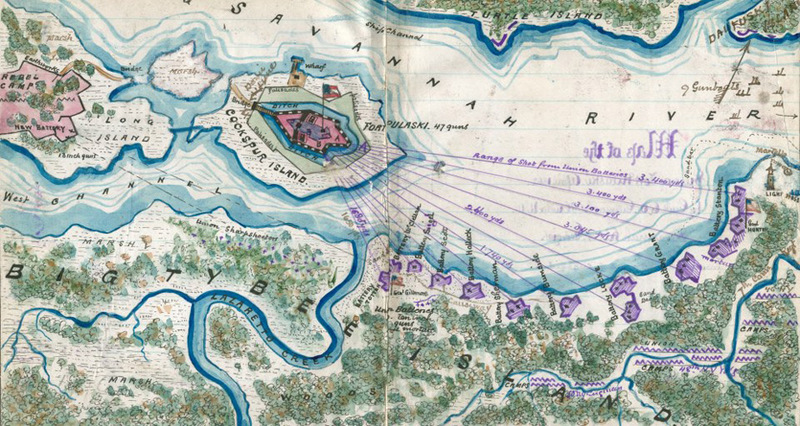 The Fort would come to serve as the last stop on the underground railroad (slaves were immediately freed upon reaching Cockspur Island), and, in time, the city of Savannah would broker a deal to surrender, in order to avoid the fate of Atlanta, which had been burned by Union troops. Here’s the message that I walked away from Fort Pulaski with… Every time America is attacked, our first instinct is to erect barriers against the same thing happening again. In the case of the British attack on Washington in 1814, that meant building million-dollar forts along the eastern seaboard. And, in our case, that meant outlawing pocket knives on planes, fortifying cockpits, and intercepting every possible communication made by living persons on the planet earth. Here’s the thing, though. It doesn’t work. 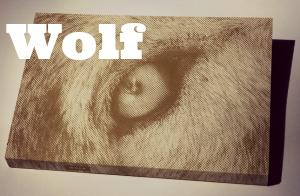 Technology changes, tactics evolve, and our enemies never stop adapting. There is no such thing as an invincible defense. There never has been, and there never will be. With that said, I don’t think that we should just lay down and give up. I think it’s necessary to take reasonable precautions. I just think it’s stupid to fool ourselves into thinking that, if we just build another wall, or create another multi-billion dollar NSA datacenter, that we’ll be safe. And, in fact, that illusion of security may actually be our undoing. This entry was posted in History, Mark's Life, Uncategorized and tagged 9/11, Abraham Lincoln, cannons, Charles H. Olmstead, Civil War, Cockspur Island, David Hunter, Emancipation Proclamation, fear, Fort Pulaski, General Order Number Eleven, Georgia, history repeats itself, James Madison, Joseph E. Brown, Joseph Gilbert Totten, Kazimierz Pułaski, military strategy, Quincy A. Gillmore, Revolutionary War, Robert E. Lee, Savannah, Siege of Savannah, slavery, South Carolina, underground railroad, War of 1812, West Point. Bookmark the permalink. Post a comment or leave a trackback: Trackback URL. Nicely written, I read every word. Quite a bit of histiry in that one place with it’s own story, your conclusion fits in well. It also helped that the attacking Union army knew the layout of the fort, and where they stored their gun powder. All they had to do was take out the opposite wall, giving them a straight shot at it. Once exploding shells started getting near it, the Confederates knew they had to surrender. Why didn’t the Confederates have scouts on the surrounding islands? That seems to me like a huge failure on their on their part. They should have invented predator drones earlier. No matter how good your fort is, you still need snipers hiding in the weeds. I haven’t seen Abe Lincoln vs. the Zombies. How do the zombies get into the fort? Indeed. Very Well Said. 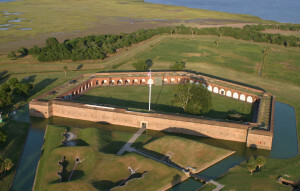 I worked at Fort Pulaski for 6 years. You fully realized what those that are employed as Park Rangers (Interpretation) are charged to do. The interpretation that they provide is one of the language of History. I think you did have to come to Georgia to see it this way. The Confederates were more than confident in the fort (which is still intact unlike Fort Sumter) and literally they were left with their pants down after 30 hours of parrot riffle shot and shell and surrendered. Only one person died in the battle. But, its implications are historical for the nation. The Union was able to walk over the bricks the busted out to breach the wall. Thank you for taking the time to leave a comment, Ann. I’m glad to know that my post has your approval. Great article! I live in Atlanta and recently took my 18 yr old daughter over to Savannah for the weekend. She is interested in history so I took her out to the fort. We spent about 4 hours there and were lucky enough to be there on a Saturday when they fired the cannon. Agree that history provides the lessons, we just have to be interested and open to hearing what the past is trying to tell us! Well done. There were 42 forts built based on work by Totten and Simon Bernard who formed the first Engineer board and the report was in 1821. These forts were designed to defend against enemy naval attacks. They were not necessarily designed for a civil war. You are right that technology and tactics changed and overcame their purpose. And I agree with your conclusion related to today. I read every word of your article — I am going to Tybee Island in October (have stayed there before and visited Fort Pulaski) and plan on visiting the fort. It has been beautifully preserved — plus they allow you to bring your leashed dogs and walk around inside and outside the fort (excepting the gift shop!) They even have bowls of water outside the gift shop in case your dog gets thirsty. Anyway — off topic there, reminiscing — you did a great job and SEVERAL people read it and have commented. Certainly not a waste of time. I’d like to visit some other star forts or pre-civil-war forts. Any suggestions within a drive of Tybee? My favorite thing was the incredible number of bricks estimated to build it.